How Much Does It Cost To Do An MBA In 2018? As students prepare for b-school GD-PIs, we look at approximately 50 Management schools across India to assess the fees that they charge and rank them accordingly. This comes after we released the list of India’s Most Desirable B-Schools , where we ranked Management Schools across India on the basis of how desirable our users feel these b-schools are. For this analysis, we first asked aspirants on InsideIIM what they think is an acceptable cost for an MBA. You can find out more about this in our report What Is The Reasonable All-Inclusive Cost Of Doing An MBA? We then came up with the list of what it actually costs to do an MBA from a b-school in India. Compared to last year, b-schools have maintained the trend of an average fee of almost 14 Lakh Rupees for 2-year MBA programmes. The top 3 old IIMs have hiked their fees as compared to last year, while IIM Lucknow remains the cheapest old IIM to do an MBA from. 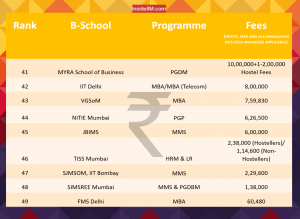 The b-schools are listed in descending order of the fee that they charge. None of the figures here include costs of Foreign Exchange or Excursions. The range for the cost of accommodation has been mentioned along with the respective fees of the b-school. The table below is inclusive of the fees as well as the batch size of the respective colleges. ISB Hyderabad maintains its position as the most expensive b-school in India. This was expected, considering it is globally the highest ranked Indian b-school. It is also a 1-year programme, so although it is expensive, it allows students to complete the course faster than other programmes, which subsequently allows students to start earning sooner. If you compare these figures with those in our report How Much Does It Cost To Do A MBA In India In 2017 , you will discover that the top 3 IIMs have hiked their fees, with IIM Ahmedabad jumping 5 places and actually going above the likes of MISB Bocconi and XLRI Jamshedpur to become the 2nd most expensive b-School in India. Other top colleges such as MDI, IMT and SIBM Pune have also hiked their fees, with SIBM Pune jumping from the 8th most expensive to the 3rd most expensive b-school. XLRI has seen no change in their fees. Coming to other IIMs, IIM Lucknow maintains its fee structure as in 2017, and remains the cheapest of the old IIM, while IIM Indore sees a slight hike. IIM Kozikhode has hiked its fees as compared to 2017. 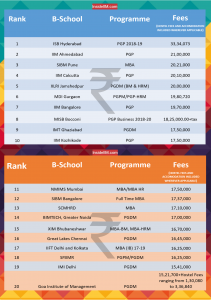 Symbiosis b-schools are gradually becoming more expensive, with SIBM Pune, SIBM Bangalore, and SCMHRD featuring in the top 15 of the list. The other end of the list features FMS Delhi, one the most sought after Management Institutes; with such a high ranking, relatively small batch size, great return on investment, and fees less than 3% of the fees of other top Institutes, there are no points for guessing why. TISS and JBIMS also feature in the less expensive spectrum of the list. 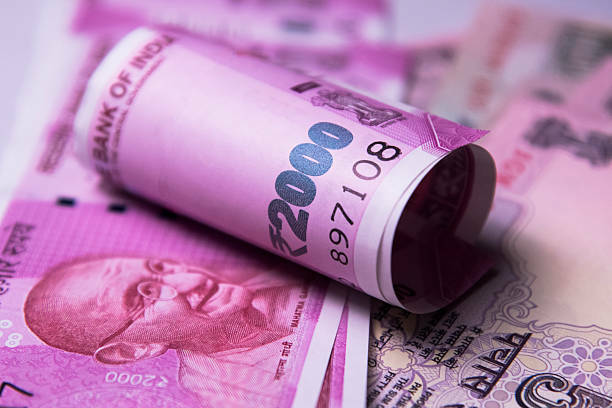 While pursuing an MBA becomes more expensive almost every year, top b-schools such as FMS, JBIMS and even IIM Lucknow come as a relief to those who are ambitious but quiver at the thought of being in debt of education loans for 5-6 years of their lives. So as an aspirant reading this analysis, what amount do you think you would want to pay for a 2-year MBA programme in India? Does an IIM tag compensate for these costs? Or would you consider spending a higher amount than what you would pay at ISB and study abroad?